Time Inc. Launches VR Platform, Resurrects "Life"
Oklahoma Gazette's mission is to stimulate, examine and inform the public on local quality-of-life issues and social needs, recognize community accomplishments, and provide a forum for inspiration, participation and interaction across all media. Coatings World is a B2B brand intended for individuals with broad-based interests in the paint and coatings industries. The Absolute Sound is a consumer brand intended for individuals with broad-based interests in home and professional audio products. The 2016 – 2017 B2B Information and Resource Guide will be available October 31, 2016. To view the guide, go to our website at www.verifiedaudit.com. Select the "Members" button and then "Procedures & Regulations" on the left side of the page. You will need your username and password to download a PDF of the guide. There is additional information available to members, including the Telemarketing Guide, Online Wizard Guide and Online Subscription Management Guide. Time Inc. has debuted a dedicated virtual reality (VR) platform that will host all VR content for the company's brands, called Life VR. The platform's name is an extension of the Life brand, a magazine that shuttered in 2007 and now exists as a photo section of the main Time site. Chris Hercik, SVP Content + Creative of The Foundry, Time Inc.'s content studio, called VR "an exciting new tool in content creation," stating that it allowed the company to "push the boundaries of this leading-edge technology as an entertainment and news medium" in creative development distribution methods. Life VR is available for free on desktop and mobile web across Time Inc. sites and as an app for iOS and Android. It is also available for Cardboard, HTC Vive, Oculus Rift and Samsung Gear VR powered by Oculus. Time Inc. plans to produce more 360-degree videos later this fall, per a spokesperson, and across other Time Inc. brands, which include Sports Illustrated, People and Entertainment Weekly. "Today, we are launching with very powerful and distinct experiences, setting the tone for what our viewers can expect on an ongoing basis from Life VR. We have an aggressive editorial road map and live experiences planned for Life VR," stated Mia Tramz, Managing Editor for Life VR. Tramz told UploadVR.com that Time Inc. will launch VR experiences on this platform "frequently, with several more projects slated to debut later this year." "As we continue to build out our capabilities in VR and simultaneously ramp up our production of 360 video across the company, the pace of new Life VR content will also increase," she added. This week, the platform launches with experiences like "Defying the Nazis," the VR companion to the new Ken Burns PBS documentary. This video takes viewers on a journey by boat to leave Nazi France and seek asylum in America. Another video, "Fast Ride" from The Drive, puts viewers in the driver's seat of the Mazda 787 to run a lap at Mazda Raceway Laguna Seca. In addition, "LUMEN" is a nonlinear interactive experience that helps users de-stress in a bioluminescent forest with breathing exercises and a soothing soundtrack. Time Inc. has been experimenting with VR since last year. In October, it unveiled virtual reality experiences for InStyle and Sports Illustrated Swimsuit photo shoots. In other VR news, NBCNews.com launched Virtual Democracy Plaza with partner AltspaceVR, set in Rockefeller Center and the site of future debate watch parties, live Q&A discussions with political experts and political comedy shows in the lead up to the presidential election. 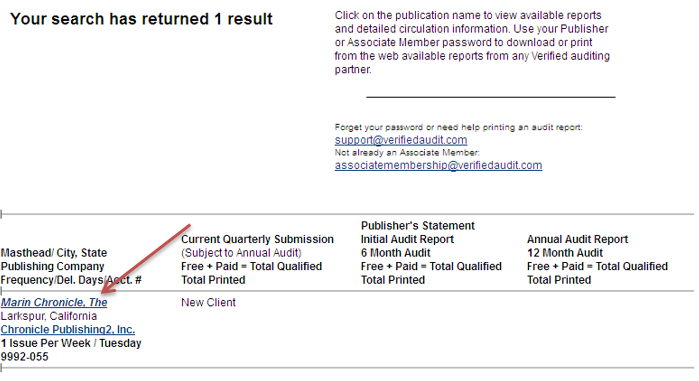 You can easily access your Audit Reports and Publisher's Statements on Verified's website. Go to www.verifiedaudit.com and select "Online Data & Reports." In the search form, enter name of the publication. You can also search for the publishing company, city, state/province, type or ZIP code. You do not have to fill in all search fields. Once you've found the publication you are looking for, select the publication name in blue. The publication's basic information will be shown, including publishing company, address, phone number and frequency. To view a report, scroll down the page until you see the list of available reports. Select the report you wish to view and a PDF of the report will be downloaded. In order to view the PDF, you need your username and password. Only the topline data (Free + Paid = Total Qualified) is available to the public. Current clients and associate members have access to all Audit Reports and Publisher's Statements. If you have any questions on how to view your audit report, please contact Verified at 415-61-6006.